Do you know you have an invisible bucket which is filled with all of your good thoughts and feelings? If you're new to the concepts of bucket filling and bucket dipping, then this award-winning book is for you. This award-winning sequel to Have You Filled a Bucket Today? Features easy-to-read chapters, colourful illustrations, and daily questions to help readers become better bucket fillers and give them the tools to live a life filled with happiness. 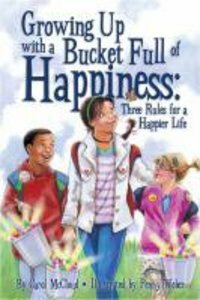 About "Growing Up With a Bucket Full of Happiness"
Carol McCloud is an early childhood specialist, popular speaker, and president of Bucket Fillers, Inc., an educational organization in Brighton, Michigan. She and her team of Bucket Filler educators have traveled across the United States giving school assemblies and staff development seminars. For information on presentations, books, and other bucketfilling products or to receive the free e-newsletter, BUCKET FILL-OSOPHY 101, visit www.bucketfillers101.com.